SACRAMENTO – In response to the Trump Administration’s effort to weaken vehicle greenhouse gas emission standards, the California Air Resources Board (CARB) today posted a proposal to ensure that cars and light-duty trucks for model years 2021-2025 continue to meet tough California standards that protect public health, save consumers money, and fight climate change. Under CARB’s existing regulation, adopted in 2012, cars meeting federal standards for model years 2017-2025 are “deemed to comply” with California standards. This provision had the benefit of creating a single national program allowing automakers to meet one set of fleet-wide standards throughout the nation, including in California and the 12 other states that have adopted California standards. Last week, however, the Trump Administration proposed to change the federal regulation and freeze vehicle greenhouse gas standards at 2020 levels. The proposed amendment announced today would clarify California’s existing regulation to ensure that if the U.S. EPA changes its standards, then automakers wishing to sell cars in California after the 2020 model year would need to meet California’s standards -- and not possibly weaker federal greenhouse gas standards in the future. The “deemed-to-comply” provision was never meant to allow a massive federal rollback to weaken public health protections in California. CARB is requesting public comments on its proposed amendments. Specifically, CARB requests comments on potential flexibilities that might allow for continued compliance with the federal standards, or reward national actions to promote cleaner vehicles. The comment period begins on August 10 and continues through September 24, 2018. The Board will consider the proposal for adoption at its regular meeting on September 27-28, 2018. The Trump Administration’s proposal would freeze the current national requirements for model year 2021-2025 vehicles at 2020 emission levels. If California were required to follow the federal rollback, global warming emissions could increase by almost 14 million metric tons (MMT) per year by 2025. That is roughly equivalent to putting an additional 2.8 million cars on the state’s roads for a year. Air pollutants such as nitrogen oxides (NOX) in the state could increase beyond 2020 levels by more than 3,600 tons annually. Californians are already living with severe impacts of climate change in the form of increasingly frequent and severe wildfires, extended drought, and rising sea levels, among other impacts. Additionally, California continues to have the worst air pollution in the country with more than 10 million people living in areas the U.S. Environmental Protection Agency has designated severe non-attainment zones for ozone. Ozone worsens symptoms of asthma, heart disease, emphysema and other serious illnesses. California’s vehicle emissions rules predate the federal Clean Air Act (CAA) and the creation of U.S. EPA. 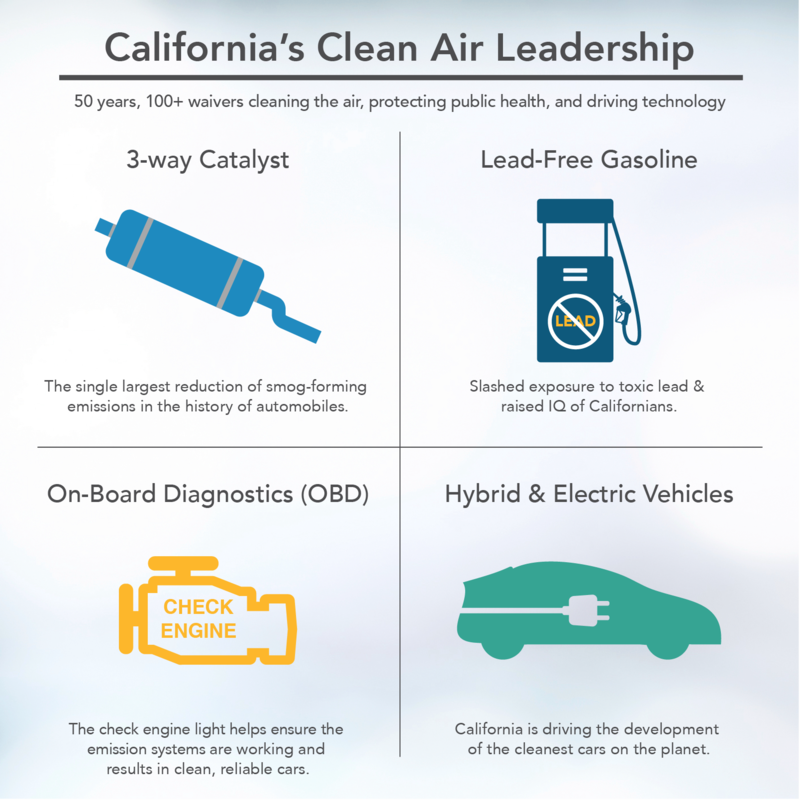 Due to the state’s severe air quality problems, related public health threat and large number of vehicles, the CAA preserved California’s rights to continue to set and enforce its own vehicle emission standards that are stricter than federal standards. California must request a waiver from U.S. EPA when its standards differ. More than 100 waivers were issued over the past 50 years. The stricter-than-federal standards approved under those waivers have been adopted by other states, and typically, were later adopted by the federal government once the significant public health and environmental benefits were clearly demonstrated. In addition to the public health and environmental benefits, California’s vehicle emissions regulations save consumers millions of dollars in fuel and maintenance costs and drive much of the creative innovation in the auto industry toward zero-emission vehicles, including hybrid and plug-in electric vehicles, and hydrogen fuel-cell vehicles. Currently, 12 other states and the District of Columbia have adopted California’s greenhouse gas emissions standards for vehicles. Colorado is also in the process of adopting them. Together, those states constitute more than one-third of the nation’s new car market. In addition, eighteen states and the District of Columbia filed suit in May after then-EPA Administrator Scott Pruitt issued a revised Final Determination stating that the existing fuel economy and greenhouse gas standards for model years 2022-2025 were not appropriate and needed to be revised. This set the stage for last week’s proposal by the Trump Administration to freeze the standards in 2020.